Speaking of blogging and blog awards, here's one that I'm ecstatic to hear about. 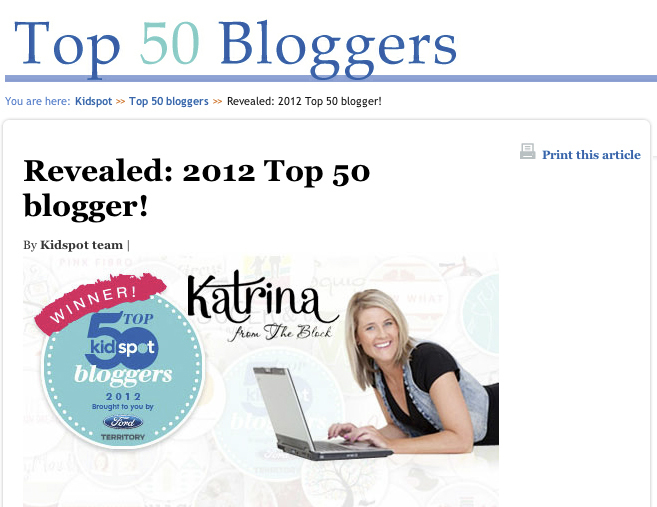 Katrina From The Block (yes, the designer of this very blog) is the overall winner in the Kidspot Top 50 Bloggers competition. She wins a Ford Territory to drive around for a year, PLUS an all-expenses paid trip to BlogHer in New York in August. I can't think of a nicer blogger to win this prize. 1. It's REAL. Katrina's personality shines through in every post, and there's not a whiff of superiority about her. She generously shares her knowledge about blogging with anyone who's interested and is very down to earth. 2. She doesn't follow the "blogging rules" that I read about on so many big blogs. She knows her stuff when it comes to blog design, but when it comes to writing, she just opens her heart and writes about anything and everything. Niche? Pfft. Those are my top two "rules" of blogging: Be real and write from the heart. This proves that you don't have to sell out to be successful. If you remain true to yourself, good things will come your way. My faith in blog awards is (somewhat) restored. Exciting news for Katrina. My guess she is still on Cloud 9. 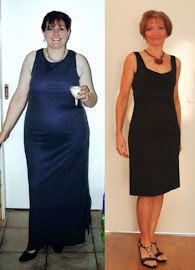 I also love reading Katrina's blog, this award for Katrina would have to be the icing on the cake.